"James, please! ... Now it's your partner's turn to speak." Along with a short piano piece and the muffled sounds of traffic outside an office in Fresno, California, that line of dialogue is among the first things you'll hear upon starting my single-player Half-Life 2 mod "Handle With Care." It's spoken by your marriage therapist, who chastises your character, James, for monopolizing the discussion and not allowing your spouse to talk. It's partly intended as a joke; you get the sense that James is loud and overbearing, but in the tradition of the Half-Life series James remains silent for the entire game. Then there's the fact that I had neither the time nor the resources to write and record dialogue for James, and I wanted players to read into James' mind and come up with their own characterizations. What will players think? Well, probably that their spouse needs to shut the hell up. First, your spouse complains about the hopelessness of communicating with your character, James, but then claims it's because James doesn't listen - which you quickly learn is due to the fact that your spouse simply doesn't speak up. But why bother speaking up when communication is so hopeless? And James doesn't listen anyway, so why speak up? And so on, ad infinitum. It's the age-old stereotype of the annoyed husband and the nagging wife, except the therapist clearly doesn't say "wife" or "husband." She says "partner." Other than the use of masculine pronouns for both spouses, the therapist's utterance of "partner" is the only word in the only line of dialogue in the entire game that directly suggests a gay relationship. There are no references to rainbows, Stonewall, Lady Gaga, Project Runway, Broadway musicals or how "beer tastes icky." 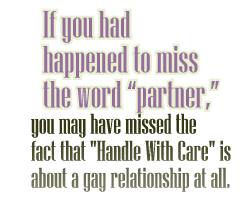 Why, if you had happened to miss the word "partner," you may have missed the fact that "Handle With Care" is about a gay relationship at all. You might have, as some players did, invented a female persona for your player character and assumed it was the same young "lady" dating Dylan from my previous mod, "Polaris." And then you would find out, whether from seeing the name "James" so often or from reading forum posts - that I had managed to "trick" you into playing as a homosexual male. Perhaps that made you angry enough to go to my website and, with the proud honor of being the first to post a comment on my work, you may have hastily written the following post: "Re relese [sic] the game without the GAY!" My response, then and still now, is: "Why on Earth would I do that?"